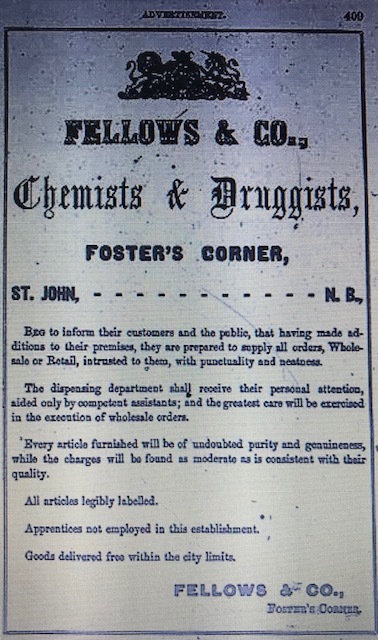 Fellows & Co., Chemists, St. John, N.B. FELLOWS & CO., chemists and druggists, wholesale and retail dealers in drugs, chemicals, perfumery and fancy articles, King cor. Germain. 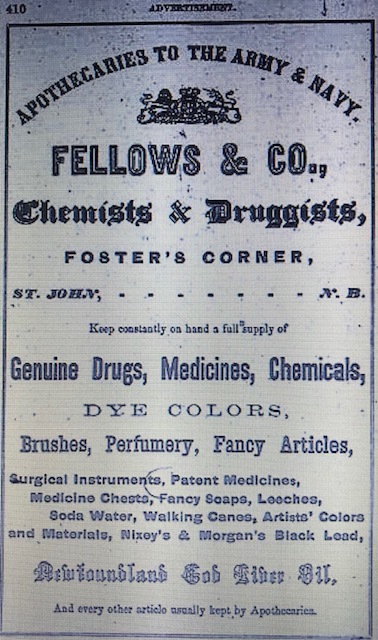 James I Fellows was also listed individually in the same directory as a druggist located at King cor. Germain. Advertisements referred to this location as Foster’s Corner. The company printed several full page advertisements in the same directory that provided some insight into their initial operation. One mentioned recent additions they had made to their premises leading me to believe that they had been in business for a while and lending more credence to a start date sometime in the 1850’s. Another called them “Apothecaries to the Army and Navy” and provided an expanded list of their products that included in addition to drugs and perfumes, items such as medicine chests, surgical supplies, dyes, paints and artist supplies and soda water. 48 Vesey Street, New York, U.S.A.
It’s not clear exactly when these facilities were established but I’ve found the Montreal location mentioned in advertisements dated as early as 1878 and London as early as 1881. The New York location was first listed in the 1886 general directory as James I Fellows, pat medicines with the 48 Vesey Street address. The directory listed James Fellows’ home address as “England,” so apparently he had moved to London and was overseeing that operation until his death in January of 1896. The New York facility remained at 48 Vesey Street until 1900. Advertisements as early as 1901 then listed them at 26 Christopher Street. In 1904, the NYC Copartnership and Corporation Directory listed them as Fellows Co., a New York corporation with the Christopher Street address. Around 1919 the name of the business changed in the directories to the Fellows Medical Manufacturing Co. but they remained listed at 26 Christopher Street through the late 1950’s. The gain by Detroit of a pharmaceutical operation accompanied the merger Wednesday of Testagar, & Co., Inc., a 30-year-old Detroit drug firm, and its affiliated firm, Fellows Medical Manufacturing Co., of New York City. Sydney J. Heinrick, president of Testagar, said the Fellows manufacturing would be brought to Detroit. Fellows, in which Testagar has held a heavy stock interest for over 10 years, has operated in the East for nearly a century. Testagar produces injectable drugs and tablets and capsules. Fellows makes prescription drugs and Fellows Syrup, a long used bitter tonic. The merger will create a new name, Fellows-Testagar, Inc. The additional operation will be joined with Testagar at 1354 West Lafayette. 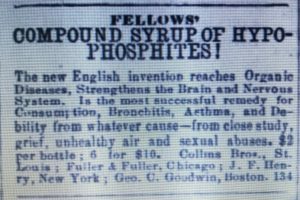 According to newspaper advertisements, their signature product, Fellows Compound Syrup of Hypophosphites, originated in 1864 – “A Family Tonic Since 1864” – and by the early 1870’s, it was being marketed over a large portion of the U.S. This advertisement, printed in an 1871 Richmond, Indiana newspaper, named distributors in New York, Boston, Chicago and St.Louis. By 1885 they were world-wide, listing principal depot locations for Fellows’ Hypophosphites in Europe, Asia, Australia, Africa and the America’s. All combined in the form of a syrup, with slight alkaline reaction. pleasant to taste, acceptable to the stomach and harmless under prolonged use. 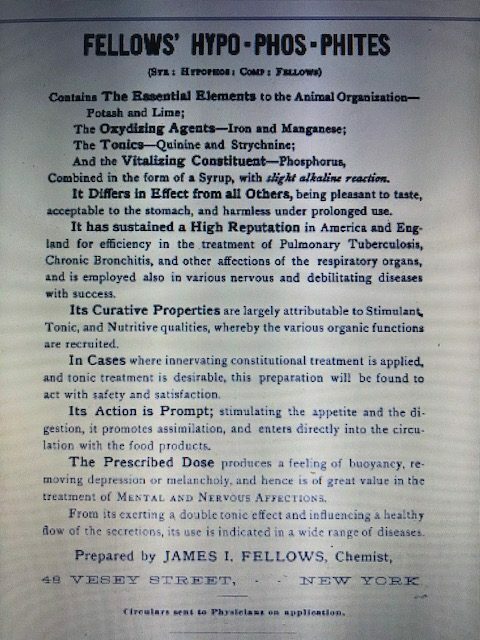 It has sustained a high reputation in America and England for efficiency in the treatment of Pulmonary Tuberculosis, Chronic Bronchitis and other affections of the respiratory organs, and is employed also in various nervous debilitating diseases with success. Wasting diseases such as Consumption, Bronchitis, Asthma, General Debility, Brain Exhaustion, Chronic Constipation, Chronic Diarrhea, Dyspepsia or Loss of Nervous Power are positively cured by Fellows Compound Syrup of Hypophosphites. 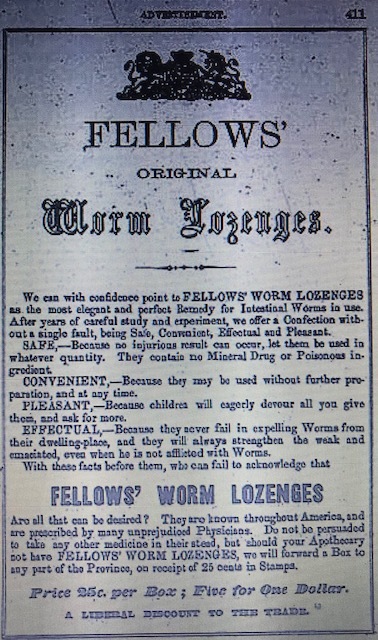 Their advertising relied heavily on the strength of testimonials; both from those who were allegedly cured as well as from the doctors whose patients were allegedly cured. The following letter, typical of a patient testimonial, appeared in the Bangor Daily Whig & Courier, on December 20, 1871. It was dated July 13, 1871 and signed “George C Font” from Baltimore Md. Mr. James I. Fellows – Sirs, I obtained three bottles of your syrup of Hypohosphites from Hegeman & Co., New York, and to its use I ascribe cessation of cough, return of appetite, removal of pains from which I had greatly suffered in the back and chest, and greatly reduced expectoration, for several months my system has suffered a drain of nearly a pint expectorated every morning and evening, caused (the doctors tell me,) from wasting of lung tissue. Your syrup has certainly worked wonders, and greatly surprised my friends, so that now I am so far recovered as to resume my wanted duties with vigor. One testimonial went so far as to include a signed and sealed statement from the Mayor of St. John, verifying the signatures of references supplied by Fellows. The Mayor didn’t stop there but actually went on to include his own endorsement of the product in his statement. 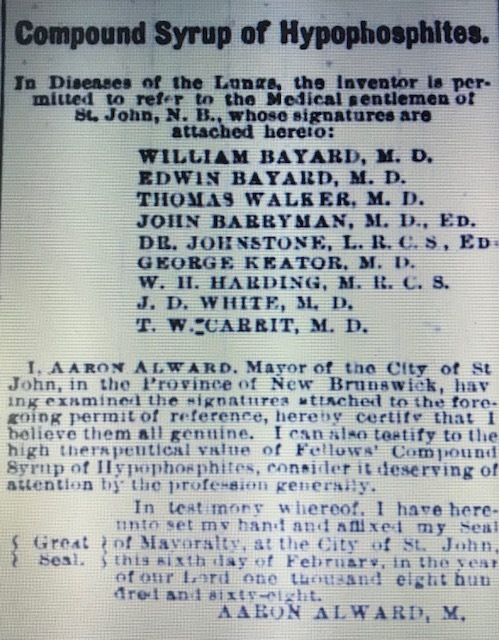 I, Aaron Alward, Mayor of the City of St. John, in the Province of New Brunswick, having examined the signatures attached to the foregoing permit of reference, hereby certify that I believe them all genuine. I can also testify to the high therapeutic value of Fellows Compound Syrup of Hydrophosphites, consider it deserving of attention by the profession generally. Examination of the literature used in the exploitation of Fellows’ Syrup fails to disclose any evidence to show that it has therapeutic value. Not only is there an entire absence of any evidence of its therapeutic value, but there is an abundance of evidence that the hypophosphites are devoid of any such therapeutic effects as they were formerly reputed to have, and that they are, so far as any effect based on their phosphorous content is concerned, singularly inert. As a result of its investigation of the therapeutic effects of the hypophosphites, the Council of Pharmacy and Chemistry concluded: “There is no evidence that they exert a physiologic effect: it has not been demonstrated that they influence any pathologic process; they are not foods.” If they are of any use, that use has never been discovered. As you might expect, the Fellows claims were toned down as time went on. All mention of cures and remedies were gone from this 1928 advertisement. Instead the product was marketed as a “good tonic” that will improve your appetite and digestion and increase your general strength. 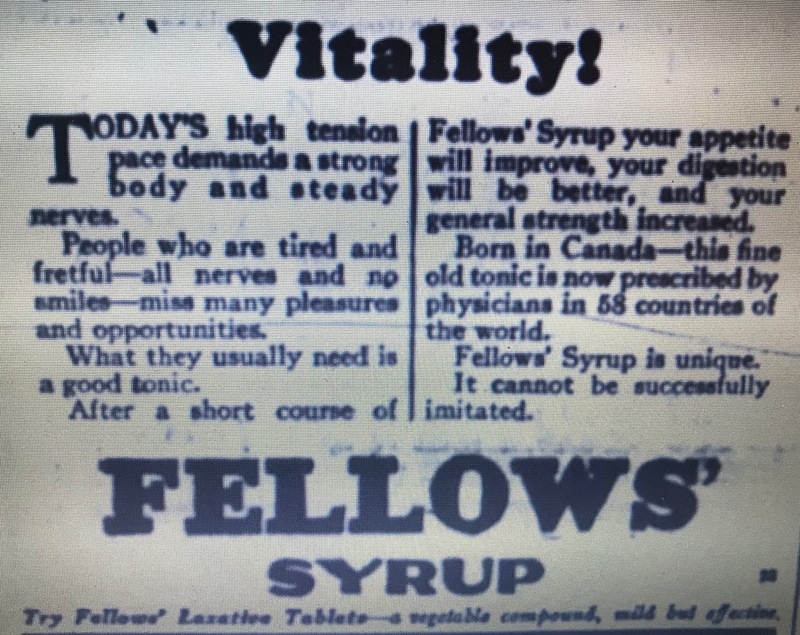 Fellows Syrup continued to appear in newspaper advertisements into the early 1960’s. This document listed the company’s business address as 48 Vesey Street, New York, and James Fellows address as Snow Hill, London. Based on this it appears that the company continued to use the New Brunswick location on their bottles even after establishing facilities in New York and London.